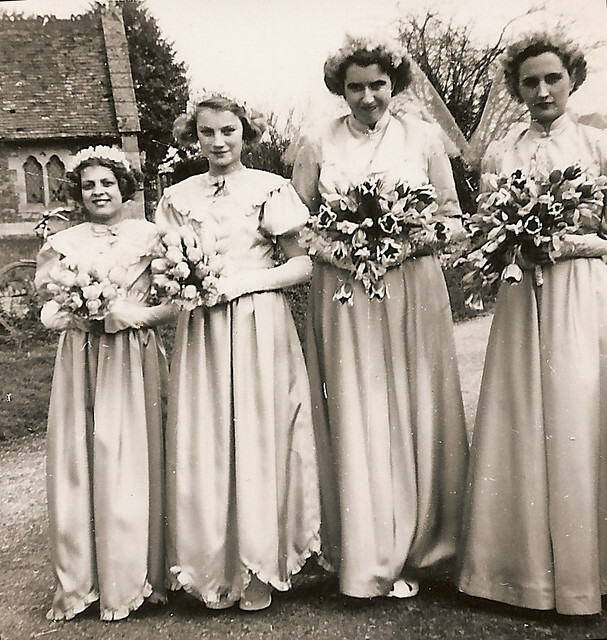 The first of my Wedding Wednesday blog series, travels back to the sleepy village of Wentworth, Cambridgeshire in 1953. 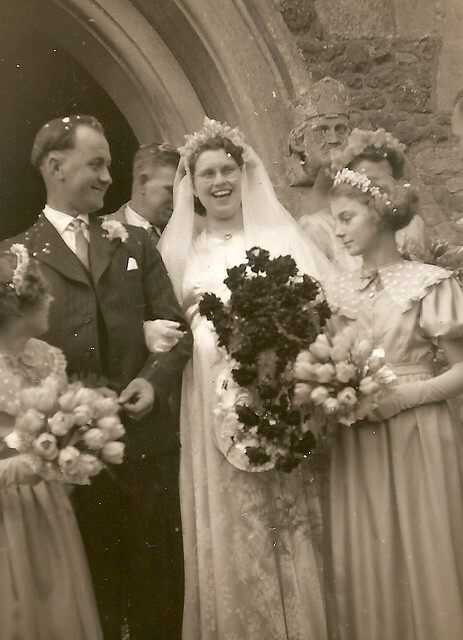 In the first of my Wedding Wednesday blog series, I’ve decided to travel back to 1953, when my maternal grandparents walked the aisle during April. 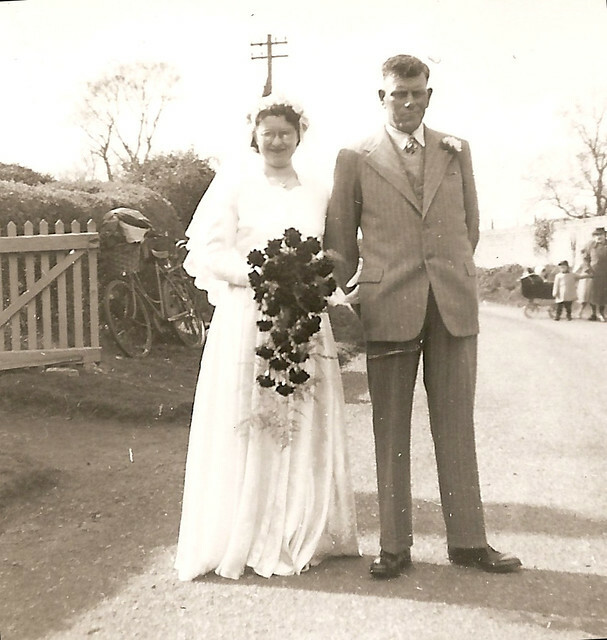 In the tiny village of Wentworth, my grandparents married. My grandfather being 21 and my grandmother being 20. Here’s the final moments of my grandmother as a single woman, on the arm of her father. She was his only child. And a little bit later, the happy couple emerge. Kudos to my grandfather there for that severe ‘short-back and sides’ look. And here are the bridesmaids in line. 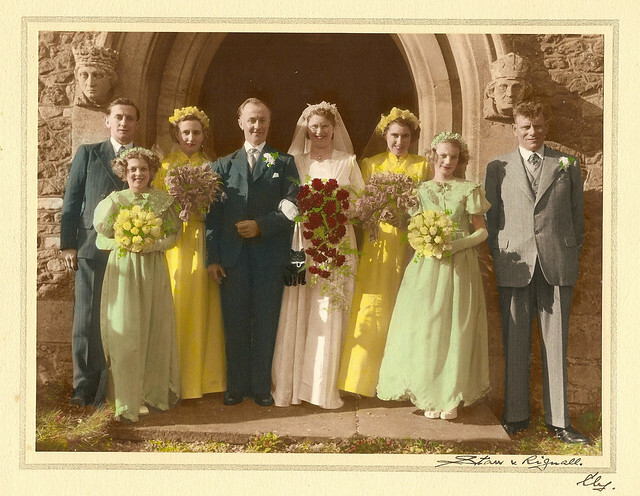 Some of the wedding party, which includes my Grandparents, Great Uncle, Great Grandparents, and Great Great Grandmothers. 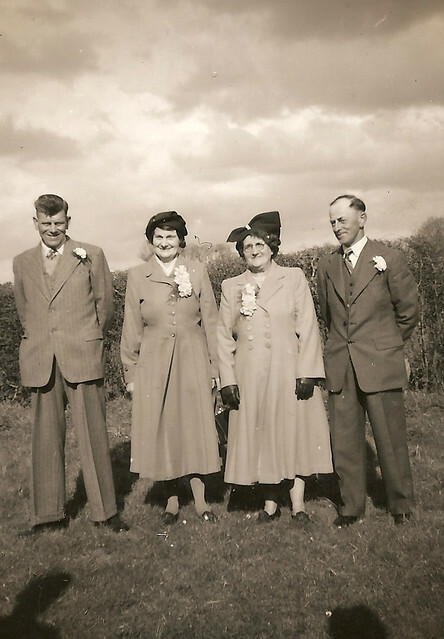 The proud parents – my Great Grandparents – (L-R) Ernest Herbert and Maude Barber, with Susan Jane and Ernest Edward Thomas Dewey. Finally, Starr & Rignall (a popular photographer’s studio) produced a series of colourised versions of some of the photos. Here’s one of them to give you an idea of the dresses. The pop-up family of Boulter are the subject of this week’s Surname Saturday theme. Can you shed any light on this name in Cambridgeshire, England? An unusual family name that stays in one village – simply popping up in records and then vanishing again. My Boulter line came to an end when my maternal Great Great Grandmother Elizabeth Boulter married John Freeman Dewey in 1878 at the tiny village of Wentworth in Cambridgeshire. Elizabeth’s parents were Robert Boulter and Mary Ann Moden who also married at Wentworth. After marrying in 1852, the couple went on to have 10 children with Elizabeth being the oldest. Out of the ten children, seven of them were daughters (one of whom did not survive infancy). 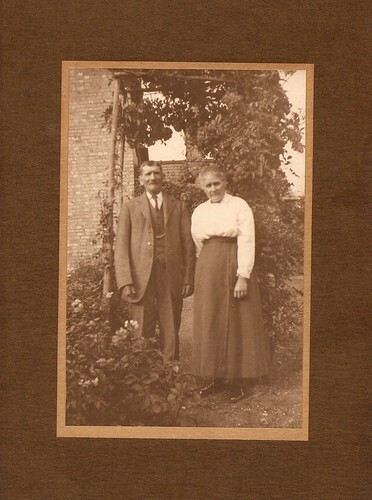 The earliest Boulter ancestors i’ve found so far is William Boulter and his wife Ann Covell – Robert’s parents. They married in 1815 (again, in Wentworth), and had at least four children – 3 sons and a daughter. I don’t yet know where William came from before his marriage to Ann – although she was from the neighbouring village of Witchford, so perhaps William was living in Wentworth in 1815. 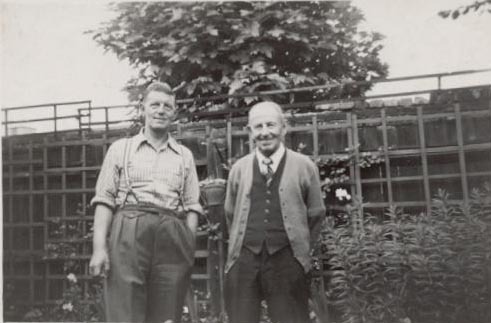 John Boulter (right), my Gt Gt Grandmother’s illegitimate first child, with his son Edward ‘Happy’ Boulter (left) – the only part of the Boulter family that I have photographs for. The mysteriousness of the family continues, with only one part of the Boulter family (not ancestral) that I have photographs of in my collection (see above) – given to me by a fellow researcher (and distant relative). The photo shows John Boulter (right), the illegitimate first son of my Gt Gt Grandmother Elizabeth Boulter, who was born five years before she married my Gt Gt Grandfather John Freeman Dewey. John Boulter occasionally takes the surname of Dewey in census returns, but this may have been more an attempt to hide the stigma attached to illegitimacy than it might have been to suggest that John was actually his father. In fact, when John got married in 1896, he names his father as ‘John Boulter – deceased’ – did he ever know the truth, or was he using his step-father’s first name? John Boulter moved to London when he was just 17 where he married Alice Watts and started a family of 11 children (the photo shows him with his third son Edward). Eventually, he joined the Corporation of London as a groom and often rode First Postilion on the Lord Mayor of London’s coach during the annual show. 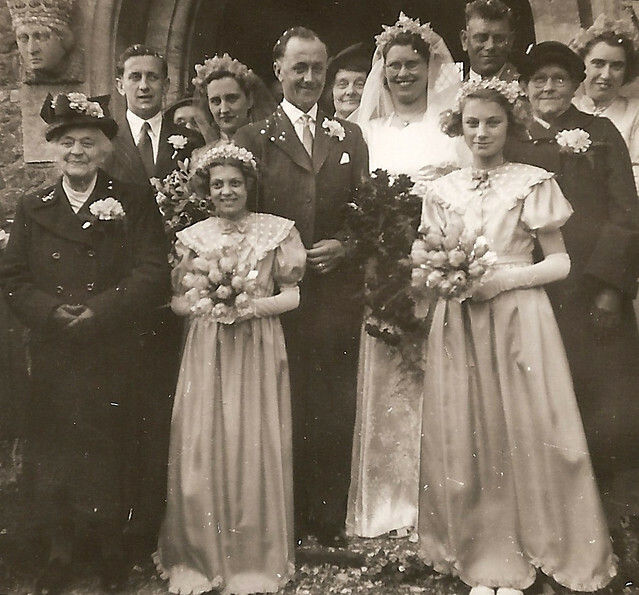 With Robert and Mary’s family consisting of a larger number of female children than male, it may go some way to explaining how/why the surname has struggled to survive in the area – with the name becoming redundant upon marriage. Ancestry.com’s mapping of the distribution of Boulter families in England, according to the 1891 census. Ancestry.com have plotted the 1891 census data for the surname, allowing me to see the distribution of 1,661 Boulter families (note – not individuals). According to this data, Cambridgeshire had just 21 families with the surname. Norfolk is the 4th highest concentration of Boulter families with 102 – with it being a neighbouring county, this data might suggest that the family went there or even came from there. Unsurprisingly London led the way with 310 and Leicestershire came second with 240 families. Wiltshire was third with 121.
he suggests that the origin is either from a ‘maker of bolts’ (as in for arrows or crossbow); a name given to someone short and stocky; or to the name of someone who sifts flour (from the Middle English term ‘bolten’ – to sift flour). I hope one day to find a photograph of my Gt Gt Grandmother Elizabeth Dewey (née Boulter), particularly as I have a photo of her husband, and I know where her grave is. She is my closest ancestor of whom I don’t have a photograph. As for finding the surname’s next generation back – I’ll be resuming the search in neighbouring parishes for clues (Witcham and Sutton are top of my list) on William’s parents, and I’ll be checking Wills to see if there are any clues left there. If you have stumbled across this unusual name in your research, please do drop me a line! 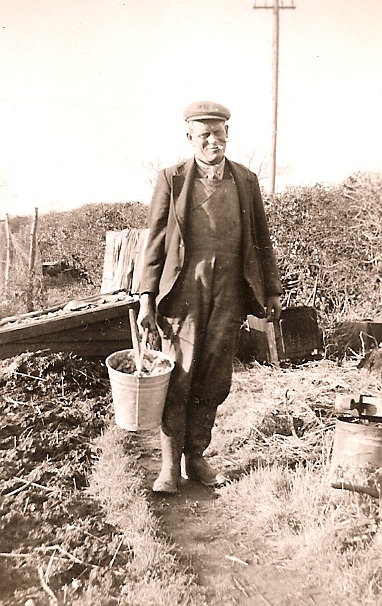 Wordless Wednesday – Ernest Herbert Barber (1902-1983) in his garden circa. 1954.